35mm engineered flush non-fire rated internal glazed door - vertical grain stiles and horizontal central grain veneer with 5mm vertical and horizontal v-grooves and 4 large rectangular vision panels with clear glass. Supplied factory finished in clear satin lacquer. Available in standard imperial sizes with 10 years manufacturing guarantee. 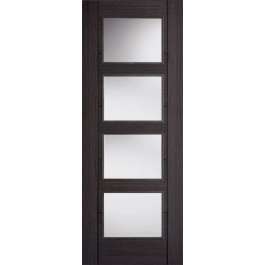 Contemporary glazed door with sleek lines creating a stylish modern design in an ash grey veneer. Matching solid and fire rated doors available.